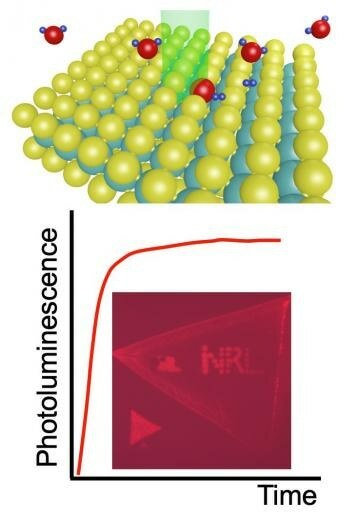 The NRL researchers formulated a versatile laser processing method to considerably enhance the optical properties of monolayer molybdenum disulfide (MoS2) — a direct gap semiconductor — with high spatial resolution. Their process yields a 100-fold increase in the material’s optical emission productivity in the areas “written” with the laser beam. According to Sivaram, atomically thin layers of transition metal dichalcogenides (TMDs), such as MoS2, are favorable components for solar cells, flexible devices, and optoelectronic sensors because of their high optical absorption and direct band gap. These semiconducting materials are particularly advantageous in applications where weight and flexibility are a premium. Unfortunately, their optical properties are often highly variable and non-uniform making it critical to improve and control the optical properties of these TMD materials to realize reliable high-efficiency devices. Defects are often detrimental to the ability of these monolayer semiconductors to emit light. These defects act as non-radiative trap states, producing heat instead of light, therefore, removing or passivating these defects is an important step towards high-efficiency optoelectronic devices. Saujan Sivaram, Ph.D., Study Lead Author, NRL. In a traditional LED, around 90% of the device is a heat sink to enhance cooling. Reduced flaws enable smaller devices to guzzle less power, which results in an extended service life for distributed sensors and low-power electronics. The scientists showed that water molecules passivate the MoS2 only when open to laser light with energy above the band gap of the TMD. The result is an increase in photoluminescence without any spectral shift. Treated regions keep a robust light emission compared to the untreated regions that display a lot weaker emission. This indicates that the laser light stimulates a chemical reaction between the ambient gas molecules and the MoS2. This is a remarkable achievement. The results of this study pave the way for the use of TMD materials critical to the success of optoelectronic devices and relevant to the Department of Defense mission. The study team includes Saujan Sivaram, Ph.D.; Aubrey Hanbicki, Ph.D.; Matthew Rosenberger, Ph.D.; Hsun-Jen Chuang, Ph.D.; Kathleen McCreary, Ph.D.; and Berend Jonker, Ph.D., from the NRL Materials Science and Technology Division, and Glenn Jernigan, Ph.D., from the NRL Electronics Science and Technology Division. Sivaram and Rosenberger hold National Research Council (NRC) fellowships at NRL. Chuang holds an American Society for Engineering Education (ASEE) fellowship at NRL. The research findings have been published in ACS Applied Materials & Interfaces; DOI: 10.1021/acsami.9b00390.